In reference to the current Wild meta, (which is the only place the Shredder sees play) the Shredder isn't a shining auto-include anymore. A four-drop body with no immediate board-impact was never terribly strong for Aggro lists, (Remember: Face-hunters never ran Shredders) and for Control-oriented lists, you'd rather slot something that guarantees you the value rather than rolls for it, like the Shifting Shade, or maybe Spiritsinger Umbra. That leaves the Shredder for Midrange lists. In practice, that means Even Shaman. And here's where it gets interesting, because it seems that the Shredder has far more competition than it used to have. The Shreddr takes the same slots as Draenei Totemcarver and Flamewreathed Faceless would which are both usual card inclusions if you want to punish heavier Reno and Control-decks by attritioning their hard minion removal. And unlike the Totemcarver and the Four-mana-seven-seven, the Shredder dies to cards like Excavated Evil and Flamestrike, even if the Shredder will leave a random body behind. That means the Totemcarver and the 477 usually overtakes the Shredder in competition for it's slot. The Piloted Shredder is also is also a far slower card that doesn't make an immediate board impact like other cards that compete for the Shredder's slot, (like Spellbreaker or Acidic Swamp Ooze) but the Shredder also does not feature the grotesque bodies that for example Flamewreathed Faceless, Sea Giant, or the Draenei Totemcarver feature. The 4/3 body is also rather frail these days, getting traded out by a number of things in the mirror such as tokens under the effect of Flametongue Totem, or a Jade Claws with a token et cetera. It shares some of Haunted Creeper's problems, without the incredible consistency and without it's incredible early-game value. Basically, other cards have outpaced the shredder. It's not as immediately impactful as a weapon or a spell would be, and it doesn't have the pure bangin' body-value anymore, even when the Deathrattle effect rolls a good minion. And to top it off, it holds the spot a tech-card might have, which is a fairly big deal considering the large amount of things you can reasonably tech against these days! For now, i'm kicking the Shredders off of my list in favor for an Aya Blackpaw and another Draenei Totemcarver. I like the idea, but the issue is: This would actually make the minion far better than Piloted Shredder is now. Recruit is not weaker, it's actually far stronger than a random 2 drop. Random 2 drops are no longer as strong as they were; they are far weaker now with so many battlecry-minions. A Piloted Shredder with Recruit a 2 cost minion would be so insane: For example as a Warlock you get always a 2/4. You also remove a minion from your deck, so the risk of getting a bad draw is far lower. And if you cube it, then you remove all unnecessary 2 drops from your deck in the lategame. No, getting a 2 drop that you now what you get is actually FAR MORE BROKEN than getting a random one that might be simply bad. Do any of you guys know a good replacement card for this now that it is wild? 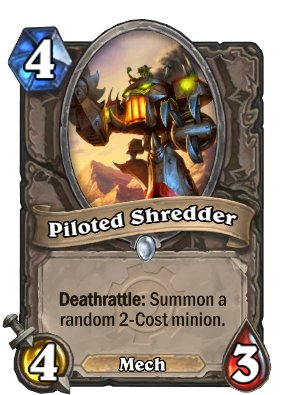 Am i actually the one that noticed that April Fools Shredder has Doomsayer on top of it? The golden is not edited. Ok, so is no one gonna comment on how AWSOME this guy looks golden?